We are happy to announce that we will arrange the Tutorial on Visual Analytics with Linked Open Data and Social Media (VisLOD2015) at ESWC2015 in Portoroz, Slovenia on May 31 or June 1, 2015. In the tutorial we will focus on mining and visualizing of interesting spatial, temporal and thematic patterns from Linked Open Data and Social Media. The teachers of the tutorial are Dr. Suvodeep Mazumdar (Uni Sheffield), Dr Tomi Kauppinen (Aalto Uni) and Dr. Anna Lisa Gentile (Uni Sheffield). Visual exploration of data enables users and analysts observe interesting patterns that can trigger new research for further investigation. With the increasing availability of Linked Data, facilitating support for making sense of the data via visual exploration tools for hypothesis generation is critical. Time and space play important roles in this because of their ability to illustrate dynamicity, from a spatial context. Yet, Linked Data visualization approaches typically have not made efficient use of time and space together, apart from typical rather static multivisualization approaches and mashups. We developed ELBAR explorer that visualizes a vast amount of scientific observational data about the Brazilian Amazon Rainforest. The core contribution is a novel mechanism for animating between the different observed values, thus illustrating the observed changes themselves. 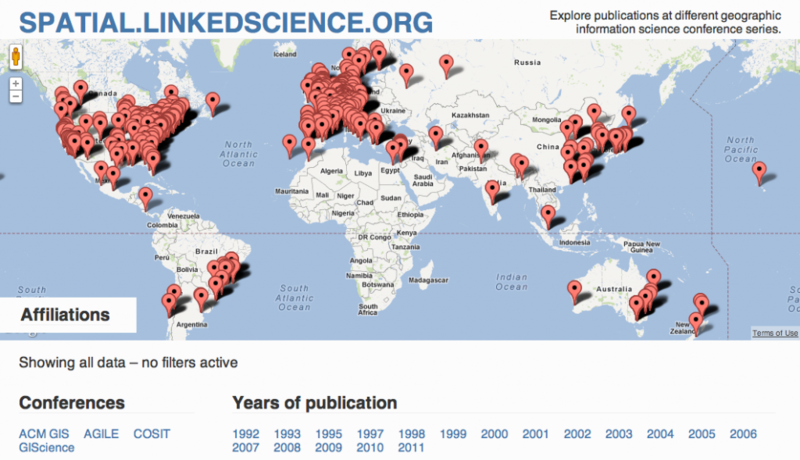 Visualisation of Social Media and Linked Data. The teachers of the VisLOD tutorial are Dr. Vitaveska Lanfranchi and Mr. Suvodeep Mazumdar from the University of Sheffield (UK) and Dr. Tomi Kauppinen from the Aalto University (Finland). Lecture, Building and Room. Future work includes fine tuning of domain and range specifications. Moreover, classes and properties will be better linked to other vocabularies. Today on May 29th a poster and a demo will be presented at the 9th Extended Semantic Web Conference (ESWC2012) related to Linked Science and LODUM projects. The poster and the demo will be presented next to each other at the Posters and Demos session for your convenience. is about Sharing and Analyzing Remote Sensing Observation Data for Linked Science and presents the Linked Brazilian Amazon Rainforest project. Below is a figure illustrating how to interact with these large amounts of Linked Spatiotemporal Data to support understanding of the ecological, social and economical dimensions of sustainable development. For more information see also the Triangle of Sustainability project. is about the Linked Open Data University of Münster – Infrastructure and Applications (see also the data portal). The idea is to open up the university’s data silos, integrate the data, and make it easy to build applications on top of the data collection. The productivity map shown as a video below is an example of such an application. 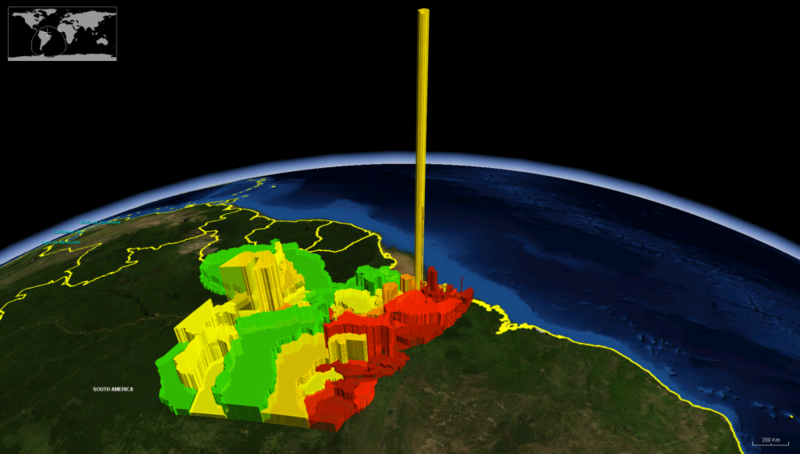 It renders the university buildings in 3D—the building height indicates the number of publications written by researchers working in the respective building. The KML file is also available for download—just open it up in Google Earth to explore the productivity map. This poster will present the Linked Brazilian Amazon Rainforest project. We will demonstrate the LODUM project through two applications. One of them, the university productivity map, is already online: read more here.